The first preferred stroke treatment option is to inject tPA, a drug that dissolves a clot to improve the blood flow. However, not all patients are eligible to receive tPA due to health concerns or if the onset of stroke symptoms began more than three hours prior to treatment. A mechanical thrombectomy is the next best treatment option, which is a procedure where an interventional radiologist guides a catheter inside the arteries to the exact site of blockage. Then, a specialized suction system grabs the clot and removes it. Mechanical thrombectomy should typically be performed within six hours of stroke symptoms beginning. However, this window of time was recently extended when two landmark stroke trials were conducted where patients were successfully treated up to 24 hours after symptoms began. A new imaging platform was the exclusive imaging tool used to aid in patient selection in both studies. On the basis of these studies, the American Heart Association and American Stroke Association approved new treatment guidelines, meaning more people who have had an ischemic stroke could be eligible for treatments. 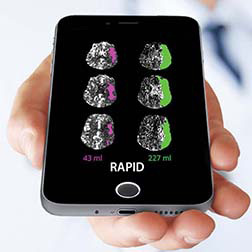 This new class of automated brain imaging software allows doctors to quickly visualize reductions in blood flow to the brain and early signs of brain injury. It identifies areas where the tissue is threatened, and it illustrates the portion of the brain that can be salvaged by performing life-saving clot removal or dissolving treatments. The faster the location of the clot can be identified and the portion of the brain affected, the faster providers can determine treatment options so the patient has the best possible outcome. With these imaging capabilities, interventional radiologists can more quickly determine and better understand how much of a patient’s brain can be saved even after the initial six hour treatment window is up. Because of this, many more patients are able to have better stroke outcomes, even up to 24 hours after stroke occurs. Not only does this provide hope to those who suffered from stroke, but it also advances their quality of life.